Last night Jon and I decided that we are now official parents. Not that all the late night snuggling, bottle feeding, diaper changing, and potty training didn’t qualify us for parenthood. But there is something about sitting in an audience, with a cheesy grin spread across your face, and proudly watching your three-year-old sport a crooked paper hat and belt out Christmas carols—or in our case, dance and chew on her shirt while the other kids sang. Karly loves to sing at home but apparently in front of a live audience, words just aren’t enough. She waved and smiled as she wiggled to Rudolph. She lay her head down on (you guessed it) Away in a Manger, hip hopped through Joy to the World, and stomped her heels all over Jingle Bells. No choreography necessary for our kid. It was like she’d preplanned her kicks, jumps, and bows. And occasionally—you had to be quick to see it behind all her krumping—she would even sing a line or two. We clapped and cheered like we were in Radio City Music Hall. Sing? Dance? We’re good with whatever she wants to do…though I got a little nervous when she unbuttoned her pants. We’ll stick to dancing with clothes on. We (as in Jon) will try and post some video later. We’re such parents! We’re on the move again! Jon has just accepted a job with an animation company in Portland so we’re leaving sunny L.A. in January and heading up to Oregon after the holidays. I’ve never been to Portland before, but so many people have told us the area is beautiful with the rivers and mountains and coast. And it was named the best biking city in the U.S. last year. Karly has decided that she wants to be a doctor when she grows up. Usually when you ask her why, she'll say: "So I can make people feel better" or "So I can be in the doctor's house." The choice doesn't surprise me. 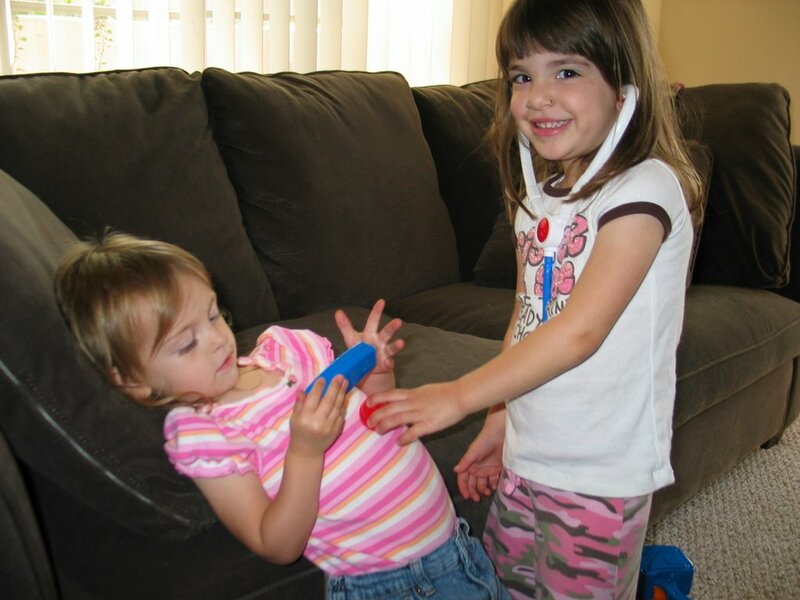 At three-years-old, she's already worried about everyone's "ouchies" and loves to play with bandaids and "check you up" with her new medical kit. While Pop Pop was here, I asked her again what she wanted to be when she grew up. "Because I want to be in charge!"